We went to the "community pool" almost every morning of vacation (The afternoon was way too hot to even think of doing anything outside... even to swim!). We had the pool almost totally to ourselves for most of the time... and were usually just joined by a few people right before we would leave for lunch. It was like our own personal resort pool. Zoe loves the water and would probably to be happy to swim every single day (We joined our town pool here at home... but sometimes... it's just too hot to think about hanging around the tot pool). She was especially excited that the Florida pool had frogs. Yes... frogs. 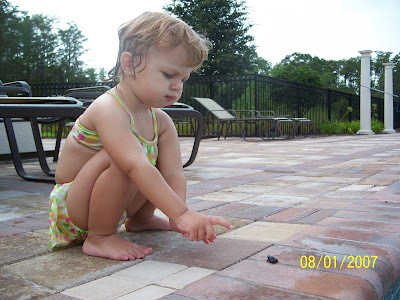 Every morning when we would get in we would do a frog-check and PopPop would "rescue" any little froggies who had made their way into the pool. We imagine they make there way up from the little pond behind the pool... and either mistakenly jump into the pool... or get washed in by rain (which seems to be a daily occurrence even though it is the "sunshine state"). I totally imagine her saying "Now Froggy... you stay outta that pool now!" Maybe we'll skip the elephant training and try frogs. There can't be that many frog trainers out there... can there?